Earlier this week Sapphire launched the Radeon HD 5830 Extreme using the well-supported "Cypress LE" graphics processor at a very competitive price relative to the NVIDIA competition and the Radeon HD 5830 graphics cards from other AMD partners. With it being part of the HD 5000 series and not one of the newer HD 6000 series graphics processors, the Linux support is already spot-on for both the official Catalyst Linux driver and within the open-source stack. 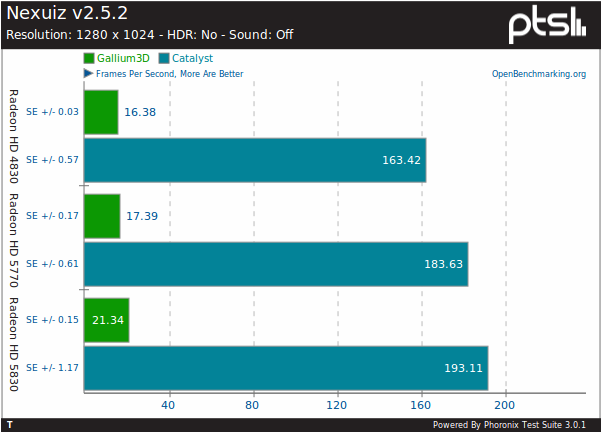 In this article are the open-source Gallium3D benchmarks for the Radeon HD 5830 along with other recent ATI/AMD GPUs to show where the latest Mesa/Gallium3D code is at today. Joining the Sapphire Radeon HD 5830 Extreme for this open-source driver benchmarking is a Radeon HD 4830 and Radeon HD 5770. No Radeon HD 6000 series graphics card was used since the Northern Islands support is still quite unstable in our tests. The same test system was used as from earlier this week, which consisted of an Intel Core i5-2500K CPU, a Sapphire Pure Black P67 Hydra motherboard, 4GB of system memory, and a 250GB Seagate SATA HDD. The software stack was Ubuntu 10.10 x86_64 with a Linux 2.6.39 kernel snapshot, xf86-video-ati 6.14.99 Git, and the latest Mesa 7.11-devel / Gallium3D git as of git-d27ff8c. The Ubuntu 10.10 software configuration also consists of the GNOME 2.32.0 desktop, X.Org Server 1.9.0, GCC 4.4.5, and the EXT4 file-system. The open-source Gallium3D "R600g" driver performance was compared to the proprietary Catalyst 11.3 Linux driver (after downgrading to the Linux 2.6.35 kernel for support). Tests included Nexuiz, Warsow, and Lightsmark at various resolutions. The test execution was controlled by the Phoronix Test Suite and results stored on OpenBenchmarking.org. While the open-source driver is improving for older Radeon hardware over the course of time as the Mesa / Gallium3D support matures -- to the point that the performance is beginning to catch-up with the Catalyst driver -- for modern GPUs this is still far from being the case. When running Nexuiz at 1280 x 1024, the Catalyst driver was 9.98x faster than the current Gallium3D stack on the Radeon HD 4830, 10.56x faster for the Radeon HD 5770, and 9.05x for the Radeon HD 5830. Even at this low resolution on these mid-range Radeon graphics cards, Nexuiz was not playable on Gallium3D (less than 30 FPS) while the proprietary Catalyst driver was churning out more than 160 FPS on all hardware.